Discount Supplements Vouchers, Discount offers and Free Gifts in April 2019. 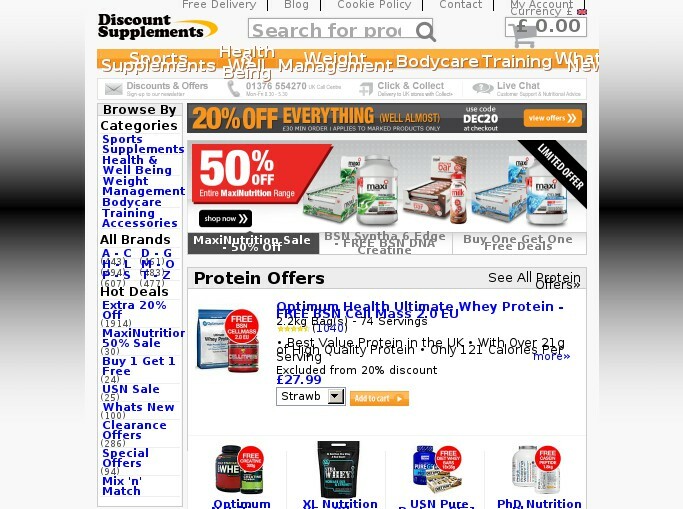 Redeem a Discount Supplements Voucher from voucher-code.ie and get your benefit at discount-supplements.co.uk. Free standard ireland delivery at discount-supplements.co.uk. No code needed, discount applied on site. Never miss again a Discount Supplements voucher or sale offer! Discount Supplements is one of Europe’s leading retailers of sports nutrition, vitamins, minerals, health and beauty products and offers an extensive range of Top UK brands include Maximuscle, Reflex, CNP, Garnell and Optimum Health as well as major US manufacturers – Now Foods, MetRx, IDS, ALRI, Optimum Nutrition, Muscle Asylum and many more. In addition Discount Supplements has a large range of sports equipment, accessories and clothing, plus fragrances, oils and skin care. They operate a Price Match Guarantee, FREE DELIVERY on all UK orders over £10 (EU over £200) and same day despatch on orders received before 3.00pm.